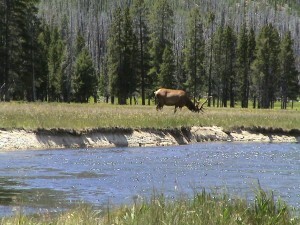 July 4 long weekend trip to Yellowstone National Park and Salt Lake City Travelouge ishtyle. Early morning flight from Baltimore to Salt Lake city. It is a 4.5 hour flight and we reached there at 11.00 am thanks to the 2 hour time difference between Utah with the east coast. Rented a car at the airport and went to see the SLC downtown. The downtown area was virtually empty in spite of it being July 4. 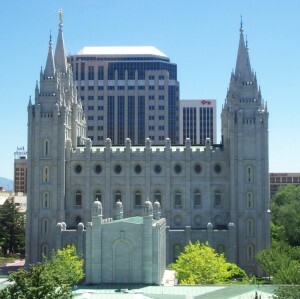 The Mormon temple dominates the downtown and is the main tourist attraction for most visitors. The majority population in SLC consists of Mormons. Mormons despite their Muslim sounding name and certain beliefs ( they practiced polygamy earlier) and despite their place of worship being called a ‘‘temple’ are a Christian denomination. That they believe in an American version of Christianity is what I could gather from the proselytizing talks of the tour guides in temple. According to their beliefs after the 12 initial prophets in ancient Jerusalem died , sometime in the 1820’s another prophet, Joseph Smith , this time in America, was blessed by the vision of God and these people who follow the latter day prophets are called Mormons. Their church is called the Church of Latter Day Saints. Most of their beliefs are similar to the other Christian denominations but they differ in having a living prophet even now and being extra orthodox with respect to religion, family values, belief in rebirth and abstaining from alcohol tobacco and even caffeine. History says that the followers of the ‘‘living prophet’ were settled earlier in Pennsylvania and Illinois but due to persecution had to flee the east coast in search of a free land to follow their beliefs. So in 1830’s the Mormons trekked all the way westward thru the hills and forests, an arduous 1,300-mile trek, following their then prophet Brigham Young till they reached Utah. Utah was then a barren mountainous region and it is of course to the credit of these Mormon pioneers that they converted this half mountainous half desert terrain, with its terrible climate and salty lake to its present hi- tech developed state. We spent some time roaming about the temple till their official guides got hold of us and gave us a tour, which mostly consisted of gently persuading all of us to instantly join the LDS. The Mormon temple was the main attraction of the tour. However, we sinners (non Mormon visitors ) were not allowed entry owing to the sanctity of the religious ceremonies conducted in the temple. We did get to see the Tabernacle which is a ellipse shaped dome like huge structure with exceptional acoustics such that a pin dropped in the center podium can be heard anywhere in the tabernacle. It also houses a huge 11500 pipe organ, which is supposed to be on of its kind on the world. The next spot to visit was a huge conference center with a seating capacity of 21000 people where they hold their weekly Sunday mass, One of the most amazing feature of this conference center was that there was a huge garden on the terrace of this conference center which had not just plants but even some trees growing atop it. By then it was time to meet Pral (=Pralhad: Seejo’s friend) and Ree (=Antony: Seejo’s brother) at the airport so we returned to the airport. By the time Pral and Ree came it was past 5 so off we started on our way to Yellowstone. Yellowstone was a long drive (5/6 hours) but the landscape varied so often and so drastically that we were kept entertained by the sudden transformation of rocky mountains to fresh green potato fields to bucolic meadows with cattle grazing in them to arid desert like regions to a green mountainous region. We camped for the night at Idaho Falls, about 70 miles away from the entrance of Yellowstone National Park. The Norris Geyser basin is one the most geothermally active regions in the world, if not the most. The guidebook assured us that it would be an experience in sight, sound and smell and boy! did it live up to it!! 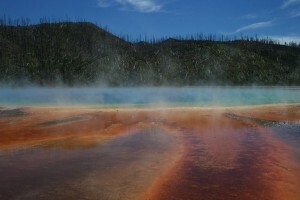 There are different trails we could follow to see most of the geysers and hot springs. Most geysers look like tiny pools with water spouting from a center opening. Some geyser pools were small but some were incredibly huge spanning several meters. The eruption time also varied from a few minutes to a few 100 years. The sight of the geysers with different colors as per the minerals or the bacteria in them, the stench of H2S and SO2 and the sounds of a erupting geyser and bubbling mud pools with boiling water all led to an unforgettable experience. 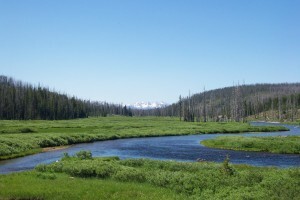 The land in Yellowstone is very fragile and since molten lave is simmering, few meters below the earths surface, geysers and holt water springs are very common. It is not surprising to find new geysers erupting everyday and in fact we saw that sometimes the roads thru the park were cordoned off right at the center as a new geyser erupted right in the middle of the road. It almost made you scared to tread firmly on the ground lest the ground gave away and we played a part in changing the ecosystem!! Other geological formations of interest in the Mammoth springs area that was interesting were petrified trees (Trees buried by volcanic ash slowly which have their inner structure replaced by minerals such that these tree trunks were literally turned to stone. ), calcite formations(huge white tower like formations with hot springs springing from the top) and the terraces(terrace like formation caused by the minerals and limestone with blue-green algae and cyano-bacteria giving it different shades and colors). We spent the evening in Hayden Valley trying to spot animals’ from the multitude of animals that reside in Yellowstone. We saw a lone black bear cub and a pair of elks and a lone coyote and yes we also had an extremely scary encounter when a bison ( which is HUGE and black and scary) ran thru the middle of the road straight towards our car. And there we were with windows open…. It was a toss up as to who was the most scared: us or the bison !! We were not terribly lucky with animals though…As Ree mentioned it was almost like Noah’s ark, the way we kept seeing animals in just ones and twos. We decided to investigate the Grand Canyon of the Yellowstone in greater detail early morning. The Yellowstone river that formed the canyon also falls as a couple of waterfalls.The Lower Falls (which falls from a height of about 300 feet which is twice the height of the Niagara Falls) and the upper falls. To get to the base of the lowerfalls involved a strenuous trek along a trail, which dropped 500 feet (150 m) in a series of more than 300 stairs and paved inclines. After that trek none of had the energy to do anything but collapse back in the car and drive to the next place. But the beauty of the falls was worth the trek. We drove to our next stop, the Old Faithful geyser area, pausing when we saw a random elk or a bison or deer, or to wet our feet in a brook, or to marvel at the at the harsh contrast provided by the trees burnt by the forest fire in 1988 to the lush green mountains or to admire the myriad colors caused by the bacteria geysers in the Madison area geyser basin and large craters caused by the geyser activity..
Reached Old Faithful at lunch time and it was faithful erupting exactly at the time that was predicted by the forest rangers. The timings that it would erupt (approximately every 60-90 minutes) are put up continuously in the nearby visitors center. The geyser erupted to about 180 feet in a spray that lasted 2-3 minutes. It was a beautiful sight although the majestic nature of it was somewhat impaired by the commercialization of the place. It was more evident because the rest of the park seemed pretty much untouched with little or no safety features and easy access routes. This place had seats all round the geyser and it almost fell like seeing a movie as I sat there with my packet of chips waiting for the show to begin. Evening walk at the Yellowstone Lake, which is huge (136 square miles) and has a thermal activity even inside the lake. It was pretty amazing to see the calm blue surface of the lake rippling suddenly as a hot water bubbled to the surface in the form of a hot water pool. We could see craters at the edge of the lakes. We took the scenic route back to SLC thru Grand Teton National park. Several people had previously told us that Grand Tetons is more beautiful than YSNP. We must have been saturated with scenic beauty because although it was certainly was very beautiful we were unable to compare the beauties of the two. Snow capped mountains in the distance was the major scenic attractions and each peak in the mountain range was each of the tetons. The largest peak was called the grand Teton (obviously!). We did get some excellent photographs of the region, especially framed by Lake Jenny. On the way back to SLC we stopped at antelopes island about 10 miles away from SLC. This island is linked to the mainland by a causeway that is almost always submerged in water. The salt lake is named so on account of its high salinity due to mineral deposits. The island however has deer, antelopes, bison and coyotes and yes a profusion of sea gulls which refused to budge from the road and we had to stop the car to wait for it to fly away. The Salt Lake is a huge Lake, which is a land, locked lake. The only way water flows out of it is through evaporation. Back to the airport to drop Pral and booked in at Marriott for the night. Ree and I decide to watch a movie after the heavy Chinese food that we had and I dropped off watching “Catch me if you can” [nice movie]. Leisurely waking up, slow bath and quick packing later we are again on your way out of the hotel. We give Ree a quick tour of the temple premises before heading towards the airport. Reached back home late at night. Back to the hurly burly city life. The vacation was an eye opener to the other side of America, the rural America. Most of what I saw was the major cities on the east and west coast. Suddenly you realize that these are a miniscule part of the entire population,most of which is rural and lives in these prairies of Wyoming, Dakotas,Idaho, Nebraska who are ranchers and farmers, growing crops or cows and staying in these vast plains below the mountains almost in the lap of nature.